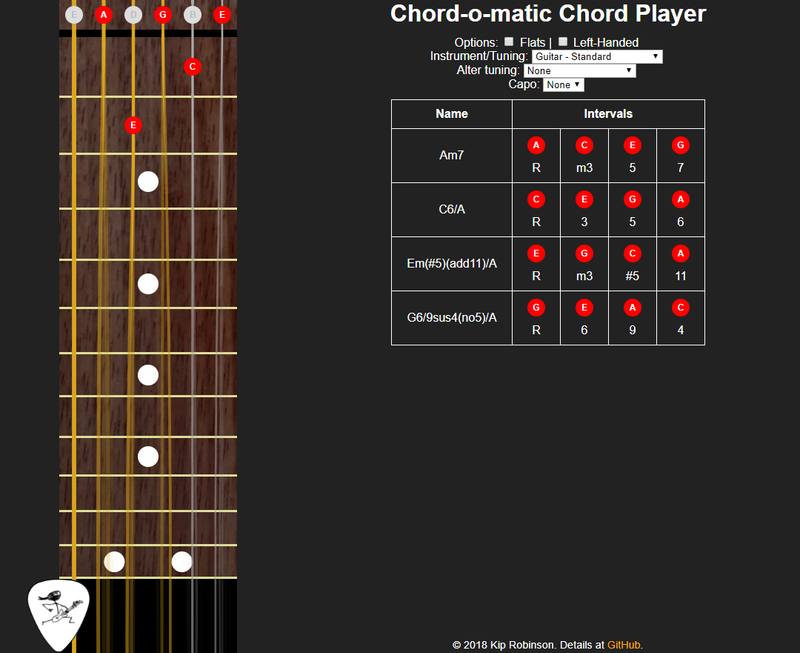 This is an app that lets you select the notes that to play on a fretboard, and it tells you possible names for the chord, and why it gave the chord that name. It also lets you hear what the chord will sound like. My reasons for writing this app come from some frustrations that I have trying to adapt music for guitar. At church, I play guitar for the kids’ choir about every other month, and the music I have to work with is never actually written for guitar. So I start with sheet music that is intended for piano and singing. The problem is I read sheet music at a first grade level. Whereas someone more knowledgeable/experienced than me can just look at the music and say “G, D7, C, G, Am, G7, G” or whatever, I take several hours to get to that point. Usually I start with the sheet music, write down the name of each note, then go back and figure out what chord is being formed by the notes played at that moment. Then I figure out where is the best place to put the capo to play the song more easily. JamPlay uses Flash, which is quickly going extinct as browser manufacturers drop support for it. I wanted something written in HTML5. I needed the option to add a capo, and to alter tuning (i.e. down half step). The front-end to render the interactive guitar. The back-end1 to take a set of pitches and return the possible names of the fingered chord. Technically, it’s all front-end, but this is the part that’s pure algorithm. For example, you might think a seventh chord is a chord with a seventh in it, but it’s actually one with a flat seventh. A chord with a seventh is called a major seventh. Unless the fifth is flat and you have a minor third (diminished chord), to get a dim7 chord you take a diminished chord and add a double-flat seventh (i.e. sixth) instead of a flat seventh like you do with any other chord. The kind of mess that results in spaghetti code no matter how hard you try. The majority of the code is indented twice. The else clause is very far from the corresponding if clause. //look it doesn't have an extra unnecessary level of indention now! The problem now is that the before and after this refactoring is not strictly identical. The negation of stuff.length > 0 is stuff.length <= 0, not stuff.length == 0. The first code would have gone through the error condition if stuff.length is negative, but the refactored code won’t. 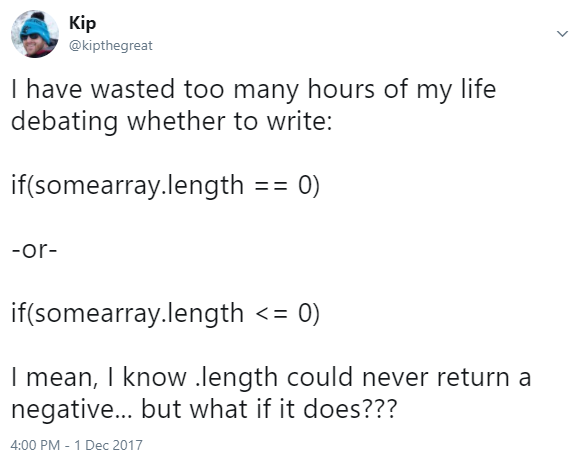 Now, I know that the length of an array will never return a negative in any programming language I’ve ever heard of. But, like I tweeted, what if it does?! And I go through this thought process everytime I encounter this situation, mentally debating the pros and cons, instead of just accepting that it doesn’t matter and moving on. Believe me, the last programmer was always an idiot. Especially when it was me. My BigFraction Java library is now available on Maven Central, free to be used in any Java project built using Maven or any compatible build tool (Gradle, Ivy, etc.). This project is something I started on my own nearly a decade ago, for my own use in solving Project Euler problems. About three years ago I put it on GitHub. Much to my surprise, several people found it and started using it. But the only way to use it was to check out the source code and build it yourself—not very practical to the way most Java projects are built today. I wanted to get the library on Maven central about a year ago, but I procrastinated for a long time thinking it would be a difficult process. Turns out, it is relatively easy, and completely free, to get your open source library hosted and indexed. If you run into any issues, please report them on GitHub. One of the cool things about being a software developer is this: if something doesn’t exist, and you want it to exist, you can make it exist. Today I was thinking about the fact that almost half of my life has been since high school. Then I started to wonder when exactly half a lifetime ago was. 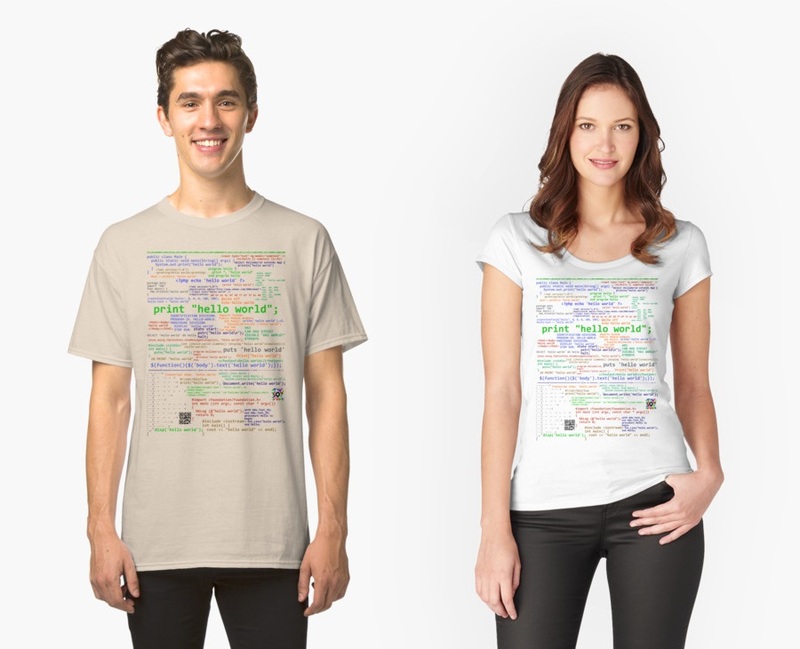 You Won't Believe How Many Hello World Programs Can Fit On A T-Shirt! I’ve designed a t-shirt that is especially for programmers. It contains the simple hello world application, written in forty-seven different programming languages. 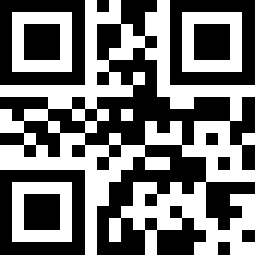 Click or Tap or Otherwise Activate This Hyperlink to Buy! Below is the “key”, for anyone interested. A few of these aren’t technically programming languages (like binary, QR), and a few are just frameworks within another language (like Angular, Swing). I’ve ordered one of the shirts myself and it looks pretty nice—I had to make sure of that before I offered it for sale. I’ll probably work on a version that works against a dark background, when I get the time. A long, long time ago, in 2015, securing a website was an expensive, tedious process. Then along came Let’s Encrypt, a non-profit certificate authority that provides SSL certificates completely for free. Real (not-self-signed) certificates that get a green padlock in your address bar. And they make the process super easy and automated. If you’re on shared hosting it might be a little harder, but your host should be able to implement it fairly easily. Dreamhost made it basically one click for me. You should read that post it’s pretty good. One thing to note is that Chrome and Firefox both have plans to start marking http connections as insecure, rather than default neutral status (the current status quo). In the last two days I’ve written a new, simple JSON Formatter. This is a very simple tool that allows you to prettify/uglify JSON data. It is basically just a textarea tied to the JSON.stringify() method that is built-in on every modern browser. I created this after being frustrated with other online formatters that don’t work well for large data because they require the data to be submitted to a server for validation. My tool runs entirely client side. Live preview here. This website is now in its second calendar year. Which means the code to print the copyright at the bottom of the page just went to an untested branch of code. Turns out it had a bug! In a previous life, I operated another blog. In the decade I spent running that site, I blogged 432 times. I have gone through the archives of that pile of random thoughts, and brought over twenty-eight posts. Think of it as my greatest hits collection. Actually doing this turned out to be a huge task—I decided with this site that I would use Markdown to compose my posts, rather than the HTML I used on the old blog. Some things like <em> and <strong> were simple enough to search/replace, but others turned into a manual process. Then I had to deal with links within the site which would no longer work, and I had to find and move over attached images. I previously announced that I would be presenting at this year’s NCDevCon. Well, I tried! The conference suffered a complete power outage partway through the second day. I still tried to give my presentation in a dark room using only my laptop’s screen pointed at the attendees, but then we hit another snafu when a fire alarm cleared out the whole building. As a result, I only got four slides in, and there is no video recording even of that part of the presentation. I have put my slides and demo application on GitHub. You’ll find instructions there on how to set up the demo application. Our kneejerk reaction when we see insecure code is to say that the developer is ignorant or incompetent. But sometimes the developer is just making a rational decision to spend his or her time churning out as many features as possible, rather than spending more time doing something that probably won’t get recognized or appreciated (writing secure code). There’s often no incentive for the developer to make the code better. Given the rate of turnover in this industry, it’s quite likely that the developer who wrote the code for Target or Sony Pictures or Office of Personnel Management, or any other recent high-profile hack, is long gone from that job. They are not being dragged before Congress to testify. Their ex-boss’s boss’s boss is. So, how do you solve this problem? Developers need to be incentivized to do the right things. I don’t mean monetary incentives. I mean the same kind of incentive you have to produce code that runs fast, or code that is stable, or a nice looking UI. Namely, that if you do those things well, you don’t have QA and product managers telling you that a million things are broken, and you have time to move on to your next task. In my view, the best way to incentivize secure code is to train QA on how to test security. If the developer knows that security will be tested, and that QA actually knows how to test it, then he or she will be more likely to spend time covering security basics to begin with. In my company, we have a document that I worked with QA to develop, which provides guidelines for basic security testing. In a lot of cases it is as simple as “Enter <b>test</b> in every form field. If you see bold text, there is an XSS vulnerability”. Or “Enter a single-quote character in every form field. If you get errors there is a SQL Injection vulnerability.” QA needs to know how to use browser developer tools to modify hidden fields and select boxes. None of this guarantees that your code will be secure. It should at least reduce very common and very preventable security vulnerabilities. There are other factors that are beyond the scope of this “101” level presentation. And sometimes it isn’t even in your control. It doesn’t matter if you won the Emmy for Best Coder last year; if you used OpenSSL you had a HeartBleed problem.